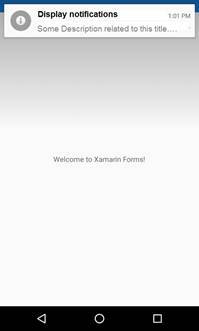 In this article, we will cover mobile alerts in Xamarim.forms. For any mobile apps, it’s important to define with the user or the client or the product owner if we work in an agile context (Scrum), for Android and for iOS, even, if we will work in a single shared project, we need to know what every environment can offer in native apps. In this article, we will cover mobile alerts in Xamarim.Forms. For any mobile app, it’s important to define with the user or the client or the product owner if we work in an Agile context (Scrum), for Android and for iOS. Even if we work in a single shared project, we need to know what every environment can offer in native apps. It’s a simple plugin: Toasts.Forms.Plugin that we can use inside Xamarin.forms project. I advise starting with it because it’s similar to native toast or notification API's especially for iOS developers. Notifications are placed in the center line to be close to the native platform with some changes in design and it allows the developer to make sound and badges. iOS uses UNNotificationRequest object to manage notifications. UWP/WinRT uses ToastNotification: it includes text or image. 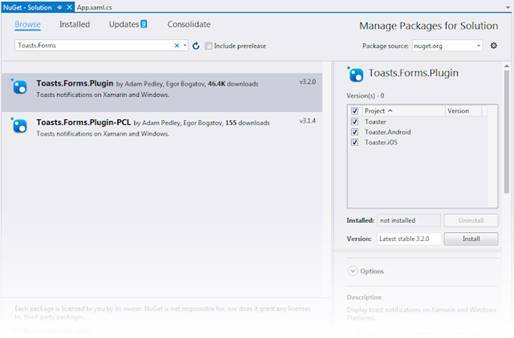 We add this plugin from NuGet Package Manager Console in Visual Studio 2017 on each platform, even your portable library, because it uses the Dependency Service. As mentioned in the project GitHub description, we need to register the dependency in every platform (Android or iOS or UWP/WinRT). We do the same for the other platforms. For iOS, we have to add a request permission to display the notifications. Now, we are able to call a notification anywhere in the app, for example, let’s go back to the main page in Portable Project to start a simple example. We start by defining the notification options like the title and description. This is the interface INotificationOptions. // Use dependency service in order to resolve IToastNotificator. It’s a popup; it’s different from Notification because we have a button (Ok or Yes/No) in an Alert. You can find a complete sample in this link. I use this Plugin: Acr.UserDialogs by Allan Ritchie. It’s a new way to use popup link with some different design from toast and Alert. As mentioned in GitHub documentation, it allows the developer “to call for standards user dialogs from shared/portable library, Actionsheets, alerts, confirmations, loading, login, progress, prompt, toast”. And the GitHub is here.